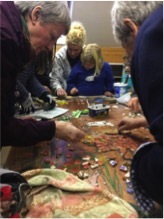 The aim of the project was to bring the Colonsay & Oransay community, particularly those most vulnerable to isolation, together over the quiet winter months to celebrate the islands’ heritage. We employed a local artist to develop and facilitate the project in the form of mosaic boards, each depicting one of the following aspects of our heritage: flora & fauna, people & places, marine & coastal landscape and religion & spirituality. Although we had planned for four boards, the interest in the sessions was greater than expected, and as such we chose larger board mounts which meant that everyone could work at once and work cooperatively, resulting in the completion of only two boards. This worked in our favour in the end as this size of board fits much better on the Village Hall, where the finished works are about to be mounted. Our initial community consultation for this project was held in the local cafe, The Pantry, in early October. The promise of a warm drink saw around 25 locals, including all the school children, attend the meeting and there was an hour-long sharing of ideas where we defined what our consulteés wanted to see in each themed board. The children, encouraged by the adults present, really contributed to conceptualising the individual themes and as such were engaged throughout the process and were excited to attend each week. The community were rallied to collect and donate any old materials that could be used and there was an enormous effort – a few large boxes of tiles and old plates even arrived off the boat from Islay! 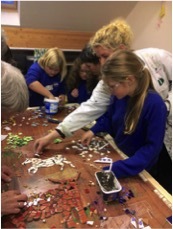 The workshops have been attended by 8-14 people each week, aged from 6-75 years of age. Although there were a couple weeks where we had to cancel as the wind was truly extreme people really came out in all conditions and we even held a workshop between Christmas and New Year at the request of one young family and their elderly neighbour! Generous grants of £1,000 from both the NHS Health & Wellbeing Fund and Calmac allowed this project to happen and provided a space for our most isolated locals to share skills, conversation (and some delicious baking) while celebrating shared heritage and beautiful surroundings. We were incredibly grateful to receive a further anonymous donation of £250 which allowed the Project Worker to run a few extra sessions and spend some time out with the workshops touching up and grouting the boards. 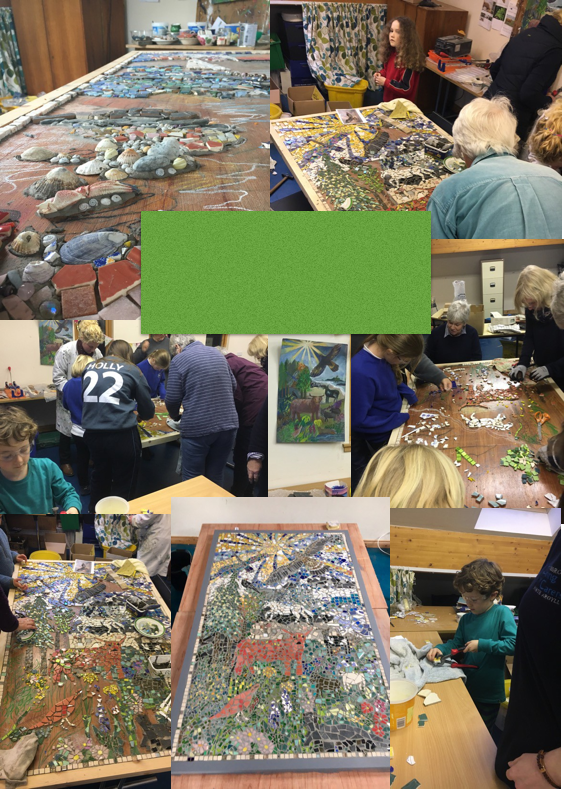 Aesthetically, the mosaics are a great success and will definitely brighten up the Village Hall and add further to the vision of Scalasaig as a dynamic hub that welcomes visitors and locals alike off the ferry. The second board is currently being primed for mounting and we hope that both will be unveiled at the CCDC AGM in June 2017.